We heard you asked for more! 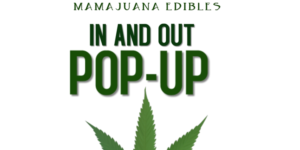 Join us at Mamajuana Edibles “IN AND OUT” Pop Up on Saturday, June 3rd from 12-4p. Come in get what you need and enjoy your day. We will have delicious edibles, flowers, music, pre-rolls, great vendors, all friendly vibes and more. Mamajuana Edibles will have cannabis-inspired items for sale and lots of delicious, potent cannabis-infused edibles to giveaway. Cash Only! This is NOT a smokeout event. Growers meet greenies who want to plant marijuana. Anyone who wants to giveaway, share or exchange weed, seeds, buds, clones, trim or plants is welcomed. It’s legal in DC.